I always knew the presidential contest would degenerate into a bit of a dog fight, but I didn't think it would actually turn into a fight about dogs. It may be barking mad, but that is what's happening - largely tongue-in-cheek - in America's social media. Forget Iran or the economy, it's canine compassion that drives the pack at the moment. Journalists have long cherished the story of Mitt Romney strapping his pet Seamus to a kennel on the top of his car for a long journey. Overcome with excitement or fear, the pet developed an upset stomach with predictable results, leading Mr Romney to make an unplanned stop and wield a hose to clear his vehicle's windows. Those who want to mock Romney relish the story, suggesting it is a prime example of a supposedly clear-eyed problem solver who's just a bit too cold-blooded and more odd than imaginative . It's even inspired a "dog lovers against Romney" campaign group. Recently his wife Ann Romney said: "The dog loved it. He would see that crate and, you know, he would, like, go crazy." I fear more politicians may try to make dogs a touchstone of the American way. Now, the right has hit back. They've uncovered a passage in Obama's autobiography where he says that while living in Indonesia, "I learned how to eat small green chill peppers raw with dinner (plenty of rice), and, away from the dinner table, I was introduced to dog meat (tough), snake meat (tougher), and roasted grasshopper (crunchy)". One blogger, Jim Treacher, wittily commented: "Say what you want about Romney, but at least he only put a dog on the roof of his car, not the roof of his mouth." He added later: "Update: Obama would never put a dog on top of a car. Dries out the meat." "#Obamadogrecipes" became a favourite twitter hash tag. Rival strategists have locked horns on Twitter and it's generated some interesting photoshopped pictures. 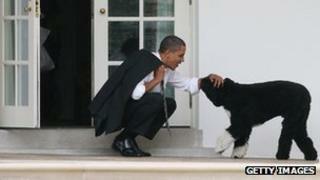 But the White House dog Bo has remained strangely silent on his own blog. Image caption Mitt Romney's wife Ann said their dog "loved" being on top of the car. Again, this story is just mainly amusing and weird, and only a few have tried to turn it into a serious issue. But like the Romney story, it plays into a larger narrative that Obama is foreign, too eager to tolerate alien ways, a man whose enjoyment of hot dogs is not limited to the all-American variety. Mostly this has been good for a giggle at the start of a fraught campaign. But I fear more politicians may try to make dogs a touchstone of the American way. Senator Scott Brown has a website page dedicated to his dogs. Is this all dying down? The Romney dog Seamus ran away. Presumed dead but perhaps he is biding his time, waiting for a contract from Fox. Journalists may be searching the Indonesian hinterland to find relatives of the six-year-old Obama's dinner and are perhaps only days away from heartbreaking interviews headlined "The president ate my great-granddaddy".